Eat five ‘portions’ of fruit and veg per day, walk 10,000 steps per day, eat no more than 30 grams of saturated fat per day: health targets; I’m sure you’ve heard plenty of them. But where do they come from, and what do they actually mean? I am not about to knock the benefits of a ‘healthy lifestyle’. A healthy lifestyle sounds great, a healthy lifesounds even better. It’s just that neither I, nor you, nor anyone else can pinpoint what that means. Do you really think that the delicate homeostatic and hormetic balance of your specific biology can be properly regulated by following a motley assortment of arbitrary ‘targets’? It seems like a sensible idea to follow such government (and health-related NGO) set maximums and minimums. Government bodies have the benefit of access to a great deal of current and historical research on the outcomes of diet and exercise regimes; we, as individuals, appear to have far less expertise, scope, and data-mining capability to wield in our battles against bulges, heart problems, diabetes, and ill-health in general. The ‘common sense’ approach, then, must surely be to pay close attention to the resulting ‘advice’ issuing forth from the likes of the US Public Health Service and the UK National Health Service. Indeed, there is nothing wrong with the principleof worldwide and national health bodies giving out such advice; it’s in the practicethat the problem lies. And ‘something’ was exactly what they got: the UK government got to look like it was doing something in the midst of what newspapers were branding a crisis; fruit and veg growers got a boost in sales; unfortunately, the public got only a new, shrill, guilt-inducing, and generally annoying piece of arbitrary marketing-speak. It would be difficult (to say the least) to find out whether this campaign has brought any health benefits whatsoever to UK citizens following its advice. I would guess that it has actually made things worse. Take the advice on fruit juice, for example. The NHS tells us, in the ‘Change4Life’ section of its website, ‘If you drink juice, a 150ml glass of unsweetened 100% fruit or vegetable juice counts as one portion – but it doesn’t matter how much more you drink, it’s still one portion.’ Although the information then goes on to add that, ‘Juice can contain quite a lot of fruit sugar, so it’s best to limit the amount you drink’, even the ‘150ml’ makes no sense given that that amount of ‘unsweetened’ orange juice can contain 3-4 teaspoons of sugar. There’s less sugar in Coca Cola. I wouldn’t take 3-4 teaspoons of sugar in an entire day, never mind in one ‘portion’. 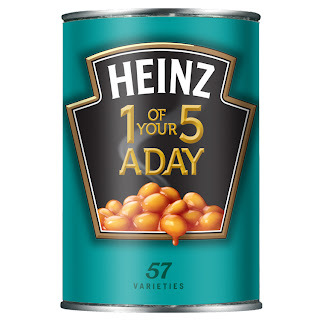 I have here in front of me a tin of Heinz baked beans that proudly proclaims in large lettering on the front of its label, ‘1 of your 5 a day’. Really? 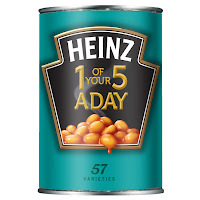 This product contains 20 grams of sugar per tin – almost all of it artificially added to the disgusting ‘rich tomato sauce’ enveloping the sorely-abused beans. The tin is marked off into four 100-gram measurements to show you just how much health benefit you are gaining with each portion of the product you eat. Nonsense. Five-a-day is easy to shoot down because it seems too ridiculous to be true, yet the NHS and UK government have allowed it to stand for ten years. And, unbelievably, it’s still running. It is dished out to us daily, along with extra dollops of smiling wellness and spangly, colourful, childish graphics. We have a problem here. It is one of credulity and of lag. We must be far more vigilant and far less credulous in our consumption of this kind of ‘health advice’, otherwise we end up in the kind of situation we are in – one where opportunistic food companies start using public health advice to punt their often-highly-suspect products. The ‘lag’ is to do with health advice more generally: we are discussing a relatively new and hypothetical field of study; consensus on human exercise and nutrition has not yet been reached, so a good deal of the advice given out is based upon speculation and is issued to the public before it has been properly tested (in effect, using us as experimental guinea pigs). I will not be eating my ‘5-a-day’ today. This is not because I am thrawn(although I can be) but because the message is unscientific: it is neat, tidy, easy-to-follow hokum. I will eat some vegetables, I might even eat some fruit; I will also eat some other foods containing high percentages of protein and fat. My brain and body will receive adequate fuel. I will question, I will rail, I will think before I swallow. I might even take some steps once this cup of coffee has made it to my bladder; they will not number 10,000. That is my front-of-the-can message. It isn’t neat, it isn’t sweet, may well be hard to stomach, and may not amount to a hill of beans. Why not ask some pertinent questions, and then design one of your own? The spangly graphics are optional.